The injuries to the Seattle Mariners pitching staff just won’t stop piling up. On Tuesday, the Mariners added recently acquired reliever David Phelps to the 10-day DL. Phelps has an impingement in his elbow. If that wasn’t bad enough, the Mariners also announced a diagnosis for longtime ace Felix Hernandez, who was placed on the DL over the weekend. Hernandez has bursitis in his shoulder, a condition that will keep him sidelined for at least three to four weeks. Phelps last appeared for the Mariners on Sunday. But he lasted just seven pitches before he was pulled amidst elbow discomfort. Despite pitching well since being traded to the Mariners last month, Phelps says his elbow didn’t feel quite right the last few times out. In seven innings since being traded to Seattle, Phelps has only yielded two runs. He’s also struck out 11 and walked just one batter in that span. However, his velocity started to dip in his most recent outings. Phelps typically sits in the mid 90’s, but his fastball was barely hitting 90 on the radar gun on Sunday. Team doctors say that Phelps is likely to be on the shelf for two to three weeks. That may seem like a short-term injury, but not for a team that spends every day fighting for its playoff life. In just seven outings, Phelps had made a positive impact on Seattle’s bullpen. To lose him to injury is no doubt deflating for the Mariners. Meanwhile, the prognosis on Hernandez is not at all what the Mariners were hoping for. 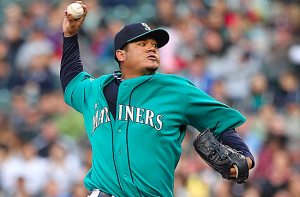 King Felix missed two months of action earlier this season with shoulder problems. He now seems destined to miss another month with another shoulder issue. Based on the timeline the Mariners gave on Tuesday, they’ll be lucky to have Hernandez back by the time the calendar flips to September. With Hernandez back on the DL, the Mariners are using Erasmo Ramirez and Marco Gonzales at the back end of their rotation. Ramirez is still trying to build up his stamina as a starter after spending most of the season in Tampa Bay’s bullpen. Gonzales made one start in place of Hernandez over the weekend but gave up five runs over four innings of work. For a team chasing a playoff spot, the back end of that rotation is far from ideal. In addition to hoping that Hernandez can return as possible, the Mariners are also awaiting the return of Hisashi Iwakuma. The veteran has made just six starts for the Mariners this season and continues to rehab from a shoulder injury. If he can come back healthy, it could provide Seattle’s rotation with a much-needed lift while they wait for Hernandez. Of course, there’s no guarantee Iwakuma will be able to return and pitch effectively this year. Amidst all the injuries to their pitching staff, the Mariners began Tuesday just one game out of the second wild-card spot in the American League. The wild-card race is quite crowded, but the Mariners remain very much in contention. It’s hard to imagine Seattle ending up on top of the wild-card standings considering all the injuries to key pitchers. But the Mariners have made it this far despite an injury-plagued season. It would be a mistake to count them out now.